AUSTRALIA: Straight Allies Cover Their Ears During State-Mandated Anti-Gay Section Of Marriage Ceremony - Joe.My.God. In a gorgeous show of solidarity, some straight allies in Australia have taken to covering their ears during the state-mandated portion of wedding vows that explicitly note that marriage is only between a man and a woman. Celebrants must tell the gathering: “Marriage, according to law in Australia, is the union of a man and a woman to the exclusion of all others, voluntarily entered into for life” – or words to that effect. Increasingly, couples and officiators are joining forces to register their displeasure at the law and its requirements. 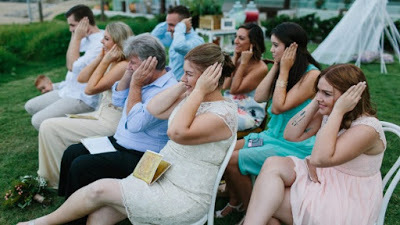 At Abbey and Mitchell Johnston’s wedding in February, guests were asked to cover their ears when celebrant Alison Bartlett read out the offending passage. Mrs Johnston came up with the idea after being informed over Skype that Ms Bartlett would be legally required to make the pronouncement. “That just did not sit easy with me,” she told Fairfax Media. “It’s a matter of equality. I just can’t believe we live in a country where it’s OK not to have equal rights for everyone.” All attendees at the intimate ceremony enthusiastically blocked their ears, Mrs Johnston said, although they were technically still able to hear the all-important dictum. And Ms Bartlett fulfilled all her statutory duties as a celebrant.